The vast majority of college students aren’t taking the number of credits needed to graduate on time, despite research showing the significant benefits of doing so – including better academic performance, higher retention rates and the increased likelihood of graduation. It has long been clear that students who enroll full-time rather than part-time are more likely to graduate. Taking 12 credit hours per semester is technically the minimum needed in many states to be considered a “full-time” student. But that number is misleading. For entrants in both associate and bachelor’s degree programs, students who earned between 24 and 29.9 credits in their first year were more than twice as likely to earn a degree as those who took fewer than 24. What’s more, students in all sub populations improved their chances even further by earning 30 credits or more. 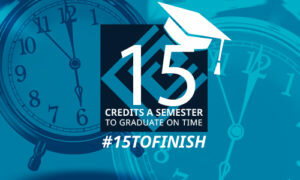 Further complicating the matter, federal financial aid policies require students to be enrolled in just 12 credits each semester to be eligible for assistance, creating a de facto standard that 12 credits is “full-time.” The result: students graduate late, if at all, and rack up unnecessary time and debt in the process. Less-prepared students are sometimes advised to attend part-time, but there is no evidence that lighter course loads help their completion rates. 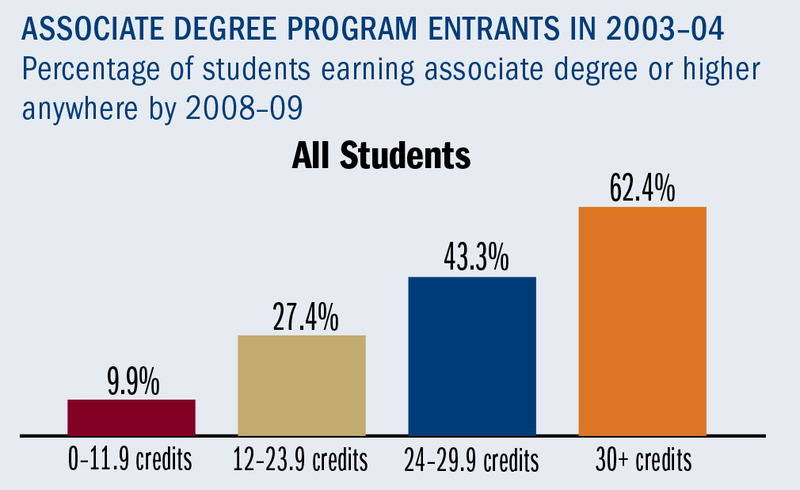 In fact, data from the 2003-04 national Beginning Postsecondary Student (BPS) indicate the opposite. Regardless of their academic strength, work schedules, race, gender, or socioeconomic categories, almost all students are more likely to complete with a real full-time load. The math is clear: in order to graduate on time, students must take at least 15 credits per semester or 30 credits per year. But even amongst full-time students, the majority are taking credit loads that automatically put them on a 3- to 4- year plan for an associate degree and a 5-year plan for a bachelor’s degree. Each extra semester comes with a cost, and the longer it takes, the more life gets in the way – decreasing the likelihood students will ever earn their degree.